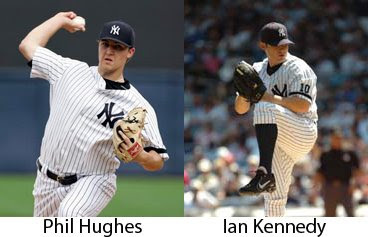 lenNY's Yankees - A Bronx Bombers Blog: Where do Hughes and Kennedy belong? Where do Hughes and Kennedy belong? Last season, when Phil Hughes and Ian Kennedy both started out in the rotation, they combined for an 0-8 record and a 7.45 ERA. This season, it's not likely that either will open up in the rotation. "I cleaned up some things mechanically and got my arm strength up," Hughes said. "I feel like I was in good shape last spring, but I've put on some good weight and worked on my changeup. My curveball is back to where I'd like it to be from 2006 and early '07, so I feel confident." If this is the case, I am excited to see what he can do for us this season. But the question remains, where does he belong? I think Hughes has done enough in the minors. He needs to be in the bullpen for the Yankees this season and I think the long-relief role is perfect for him. Let's face it, Joba Chamberlain is not going to make 33 starts for us this year. I definitely see Hughes making a few starts in place of Joba this season. "I feel like I grew as a pitcher, just as far as maturity and making in-game adjustments rather than postgame or post-inning," Kennedy said. "This offseason, knowing that every other day someone signed, it still didn't change my mentality. "I knew if I wanted to make any part of the rotation or have a spot, I'd have to work really hard and come to Spring Training ready. All I can do is work hard and show them that I want this, that I want to have the chance again." Why do I love CC Sabathia for the Yankees? Save his first four wretched starts of 2008, CC pitched seven-plus innings in 24 out of 31 starts, including 10 complete games. Just think how much he is going to save our young arms this season. Personally i think that Hughes should be penciled in at the number 4 or 5 spot of the rotation, with Andy P right there as well. (CC, Wang, Burnett, Hughes/Andy, Hughes/Andy..basically like that) As much as i love seeing Joba start he really should be in the bullpen. Rivera is bound to retire within the next 2 years and we're going to need another stud closer for the next 10-15 years, and our answer is right there. I mean the BoSox took advantage of Papelbon's electric stuff and turned a light's out starter into a shutdown closer. Hughes' performance last year was just an off year with being plagued with injuries and pressure. At the end of the rotation he will have less pressure on him than he did last year. So far this spring he hasn't looked bad at all and should be thrown in at the end of the rotation. Kennedy on the other hand should not even be in the majors this year but should be in Scranton for atleast half of the season (Yanks should actually try and shop him around with Melky for a more promising young arm). So finally i think the yanks should have Hughes in the rotation, Joba as the set-up man and heir to the closer role, and either keep Kennedy in the minors or try and trade him with Melky for a more promising pitcher. I think you and I have been spoiled having Rivera as our closer. A guy like Rivera doesn't come along every year, and Joba hasn't come close to what Rivera has done. If anything, we can take Joba's most pressure-packed moment (when he blew it against the Indians with the stupid bugs) and say he doesn't perform well under pressure. Rivera would have been completely unfazed. I have heard rumors that our prospect, Mark Melancon, has a chance to be a closer for us in the future. I think Joba belongs in the rotation. Phil Hughes a starter? He's never really had that great success in the majors. When he did well his rookie year, he didn't do THAT well... I think he would benefit in the bullpen this year, and then see where we are next year. I like your idea of trading Kennedy and Melky for another young pitching prospect. That would be a solid move for us. Of course every Yankee fan has been spoiled by Rivera...and the 4 World Series wins in 5 years. Joba blew it against the Indians b/c of the bugs...i honestly dont think that anyone would have been able to perform in those circumstances. Even Rivera would not have been able to perform in that. Joba's got a great fastball with a slider that seems to be unhittable...2 great pitches = Dominating Closer (Just like Rivera). Hughes i believe is only 22 years old, and after last year's horrible season he's going to be real set and focused on performing well this year. Joba is our closer when mariano retires no doubt about it. Closing games is about being lights out, and there is nobody on the yankees pitching staff who is better at striking out the side than joba. Closing is as much if not more psychological than physical. The best part is how pumped up he gets, his roars striking fear into opposing batters. Kennedy is also a very good pitcher who I feel should be kept onto, because he could be our shawn chacone this year when those gagillion dollar pitchers we bought drop like flies. We've seen him shut down top major league teams in the past as a starter, making him much more proven than Alfredo Aceves (too early walks almost as many as he Ks will be good eventually), Brett Tomko (lol are you kidding me? ), Phil Coke (should bolster relief, as he's pretty good at it), Dan Giese (def not Yankee starter, maybe pirates starter)Kennedy actually has a future as a solid starter, and you know Burnet is most likely not going to last the whole year. And no the last thing we need is another old piece of crap starting pitcher by giving away two of our most exciting prospects. Melky is still a good player and Kennedy is better for the money than anyone on the market. What you could do is sign a free agent Pedro Martinez. It's risky, but he claims he can pitch at the major league level and is most importantly healthy. The trick is weather or not he will actually want to play for the yankees. Joba is not guaranteed to be the successor of Rivera. How do I know this? Peter Abraham said in the beginning of spring training that Mark Melancon has a chance to take that role. I trust Abe. The six players that I listed in this post was for the long-relief/spot starter role, not the 5th starter. Kennedy was awful last season and has absolutely no history to back him up being a "very good pitcher." Alfredo Aceves was lights out for us in September last year, and he's not a young prospect either; he's 26. So he has a lot of experience. And for Tomko, did you see him shut down the Red Sox after Wang gave up seven runs to them just a few days ago? Tomko could be one of the mop-up guys that pitches when the Yanks are down or up by a lot. I think Pankey's idea was to trade Melky and another prospect for a young pitching prospect - not "another old piece of crap starting pitcher". Pedro Martinez a Yankee? Never. Did you see him throw down Zimmer? The Yankees hate him so much, that fans would laugh him out of the stadium. It's not up to him, it's up to the Yankees.